Players who think 7 is their lucky number will love the Diamond 7s slots, as the theme is all about some diamond encrusted 7s. Click here to play! It certainly not inspired, but it may grant you the good fortune you need to take away a massive jackpot of up to 2500 coins. You'll need to be lucky to score the biggest wins on the Diamond 7s slots, as only 1 payline can be played. While red cherries can win you money regardless of how many land on the payline, most other symbols require at least 3 of a kind for a win to be paid, though Any 7s combos and Any BAR combos are also possible. 3 Diamond 7s on the payline are needed while playing all 3 coins to win the top jackpot, but a lucky player never knows when they'll hit a hot streak. 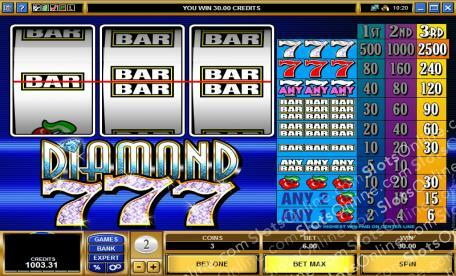 If you are interested in a simple 3-reel slots game, and 7 is your lucky number, then it's amazing that you haven't already started playing the Diamond 7s slots.